Douglas Fairbanks returns to the well in Don Q, Son of Zorro, once more donning the mask and cape that made him a superstar in The Mark of Zorro. 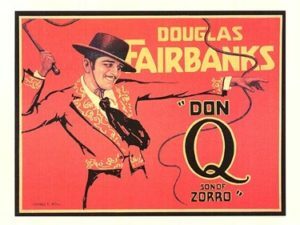 This time around Fairbanks plays both the aging Don Diego de Vega—Zorro—and his son, Cesar de Vega, in a story adapted from a non-Zorro novel, Don Q’s Love Story. Returned from California to Spain, young Cesar astounds his high-society friends with his tricks with an American bullwhip. (Fairbanks trained with the whip for six weeks to get it right.) Shenanigans with the whip get him into trouble with the queen’s guards, and in no time he’s using it in signature Fairbanks style to hogtie sergeants, swing from balconies, and lasso a bull that broke out from the corrida. But then, escaping the guards through a noble’s garden, he meets the luminous Dolores de Muro, played by Mary Astor. You know Astor as the femme fatale Brigid O’Shaughnessy in John Huston’s version of The Maltese Falcon, but fifteen years earlier she was a silent movie star, a dewy ingénue with a languishing look. Cesar falls in love with Dolores at first sight—but so does the pursuing guard captain, Don Sebastian, and soon he and Cesar are rivals for Dolores’s affection. Sebastian is a dastard, however, who stoops to foul play. After the colossal epics painted on broad canvasses in Robin Hood and Thief of Bagdad, it must have been a relief to return to the drawing rooms and cabarets of a romantic melodrama, and indeed, the ever-charismatic Fairbanks seems relaxed and comfortable in this film, happy to be doing what he did best. He dances flamenco with a Gypsy, brawls with a gang of back-alley goons, and cuts out his rival at the archduke’s ball. When Cesar is framed by Sebastian for the murder of the archduke, things get serious. He fakes his own death in a trick worthy of his father, and then it’s outlaw time until he can clear his name. It takes both clever chicanery and dashing sword (and whip) play, but virtue wins out in the end, as the son of Zorro proves himself the equal of his father. The exciting finale, with its call-backs to the first film, is genuinely satisfying.